Manhattan Community Board Six and Gramercy Neighborhood Associates are co-hosting a panel discussion with representatives from NYC agencies, moderated by City Council Member Rosie Mendez. Agencies will include the Office of the NY County District Attorney, NYPD’s 13th and 17th Precincts, Department of Sanitation, Department of Transportation, Parks Department, and Department of Homeless Services. 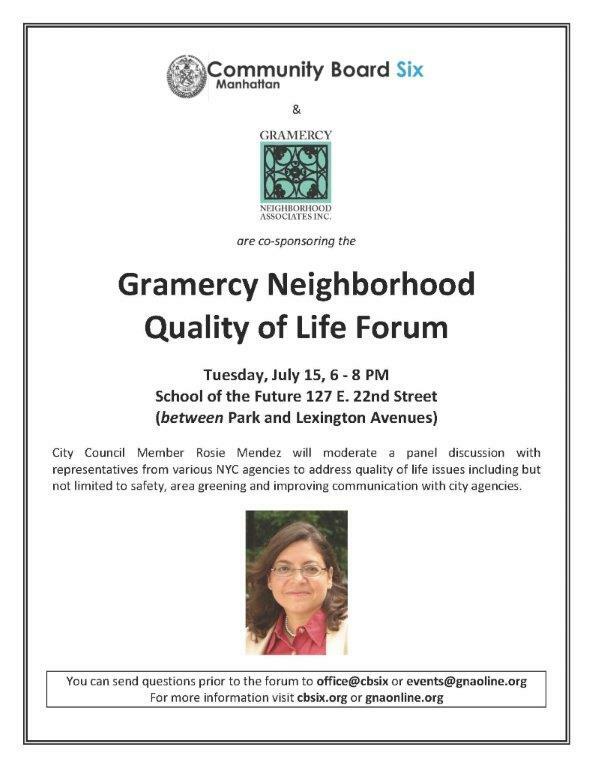 Panelists will address quality of life issues in the Gramercy neighborhood, including homelessness, safety, traffic, and sanitation. “We are committed to working with our outstanding neighborhood partners to maintain and further enhance our community’s quality of life,” said Sandro Sherrod, Chair of Community Board 6. Community Board 6 represents the area on the east side of Manhattan from 14th to 59th Streets, from the East River to Lexington Avenue, and extending west to Madison Avenue between 34th and 40th Streets. Gramercy Neighborhood Associates is a group of people living here who are dedicated to improving the area and building a sense of community. Gramercy is a NYC neighborhood including Gramercy Park, with boundaries roughly 14th St. to the south, 1st Avenue to the east, 23rd St. to the north and Park Avenue South to the west.